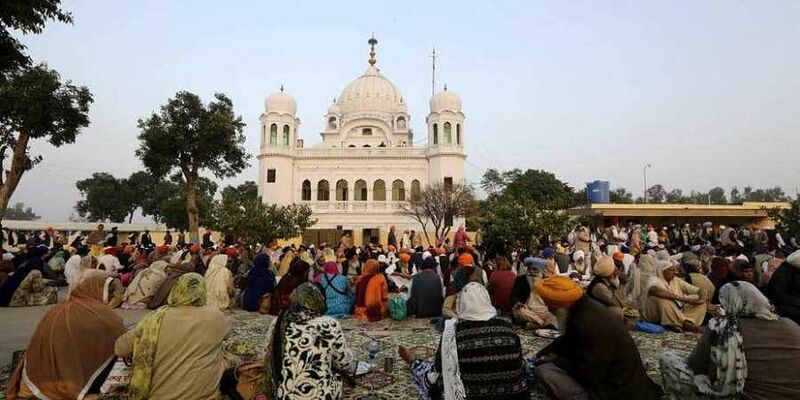 For the community, Kartarpur corridor might be a portentous moment, promising some regular, if limited, connection to the soil of Guru Nanak. Three kilometres from the Indian border, in the tranquil green plains of the Narowal district of Punjab in Pakistan is an unassuming sacred shrine: Gurdwara Kartarpur Sahib. It’s the final resting place of Guru Nanak (1469-1539), founder of the Sikh faith. On the other side of the river Ravi, about a kilometre inside the border in the Gurdaspur district of Punjab in India, is the bustling holy town of Dera Baba Nanak. Here stands Gurdwara Shri Darbar Sahib, associated with the life and family of the same first Sikh guru. On November 28, the governments of India and Pakistan took a momentous step towards making a corridor between these two gurdwaras to enable visa-free travel for pilgrims. A foundation stone-laying ceremony marked the beginning of its construction on the Pakistani side and it’s hoped that this Kartarpur corridor will be ready in 2019, when Sikhs mark the 550th anniversary of Guru Nanak’s birth. Sikhs lost the most from the partition of British India in 1947, as their spiritual and material homeland got divided between India, a majority Hindu country, and Pakistan, majority Muslim. The Kartarpur corridor, with a bridge over the river, had been mooted for almost a quarter of a century before it emerged formally in 1999. However, at the hands of two insecure and hostile states, it never materialised. As a Punjabi and as an academic of the Punjab, I’ve spent the last 18 years working on the fragmented history of this divided region and the ramifications of the fraught relationship between India and Pakistan. I have crossed the Radcliffe Line at the Wagha-Attari checkpoint – made infamous by its daily flag-lowering ritual accompanied by the sounds and sights of a masculine, jingoistic spectacle – numerous times. Ironically, as a British citizen, I’m privileged enough to cross this checkpoint – the only open border crossing – regardless of the political climate between the two countries. It pains me to see this divided legacy and narrow-minded nationalistic tentacles spread over the social, cultural and economic milieu of this historic region. As a Sikh, I’m resigned to the fact that most Sikhs will never be able to visit the birthplace of Guru Nanak and the place where he settled, preached and passed away. He spent the last 18 years of his life living in Kartarpur, setting up the first Gurdwara and establishing the first Sikh community. It was here that langar (communal cooking and dining, without price or prejudice), an integral, iconic part of the Sikh faith, began. In April 2017, I visited Gurdwara Kartarpur Sahib in Pakistan for the first time. What’s striking once you get past the security is a sense of calm that pervades the place. The original, 16th-century shrine was on the banks of the river Ravi and was ravaged by floods. Today’s structure was built from 1920 to 1929 with a princely donation from the Maharaja of Patiala. Since August 1947, the site has remained mostly closed to the public. During the 1980s, it was linked to the Sikh separatist Khalistan movement (a Sikh nationalist movement wanting a separate state). Despite further repairs and restoration in the 1990s and early 2000s, it has remained largely off the usual Sikh pilgrim circuit of Lahore-Nankana Sahib-Hasan Abdul, which are the places Sikhs are normally permitted to visit in Pakistan. A fascinating, and befitting, aspect of Kartarpur is its evident appeal to non-Sikh communities. Guru Nanak is revered by Hindus and Muslims as well as Sikhs. During my visit, I saw only a small trickle of local, mostly Muslim pilgrims who’d come to pay homage to Baba Nanak. It is these devotees who ensured that the shrine was never abandoned. The visa-free corridor presents real opportunities for the Sikh community and for India-Pakistan relations. Yet the immediate response has been Janus-faced: alternatively euphoric and wary. While Pakistan’s prime minister, Imran Khan, attended the recent ceremony and laid the foundation stone, India’s prime minister, foreign minister, and the chief minister of Indian Punjab, stayed away, citing Pakistan’s alleged involvement in recent incidents of terrorism in India. It is easy to be cynical about the significance of the new corridor, because both India and Pakistan have failed to find a peaceful way of living together for the past 71 years. Many opportunities for peace have been squandered in the past. This latest initiative, while welcome, remains a local affair and is unlikely to impact on the tense politics of the relationship between the two countries. It might well prove to only be a vanity project for Khan, but still it presents Pakistan with an opportunity to offer a peaceful fig leaf to India. Perhaps India is happy to play along for now as part of a strategy to improve its standing in Punjab ahead of elections due in 2019. But, for the Sikh community this might still be a portentous moment, promising some regular, if limited, connection to the soil of Guru Nanak.